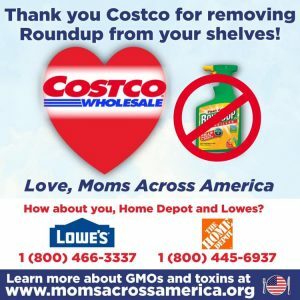 Costco has agreed to remove Roundup and all other herbicides containing glyphosate from its shelves, according to Moms Across America. The anti-GMO awareness group petitioned Costco, Lowes and Home Depot to stop selling the products after the recent Johnson vs. Monsanto-cancer verdict was upheld. The case set the precedent for thousands of other cases against Monsanto, all claiming exposure to Roundup caused non-Hodgkins lymphoma. The mom’s group gathered over 150,000 signatures on change.org, asking the three retailers to stop selling the toxic herbicide. 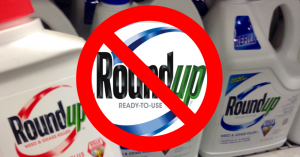 “I called the headquarters, and after two days of messages and calls, I did finally confirm with three people that Costco was not ordering Roundup or any glyphosate-based herbicides for the incoming spring shipments,” she wrote on her website. When she asked for an official statement, Honeycutt said she was told that Costco does not usually issue press releases about which items they have discontinued. UPDATE: Honeycutt has since revealed by email that Bryce Wentworth, buyer for Costco’s lawn and garden center, is one of the employees she spoke to. He didn’t want his name used at first, but has since made a public statement to the Environmental Health Center confirming the decision. Stop killing weeds, and start eating them!